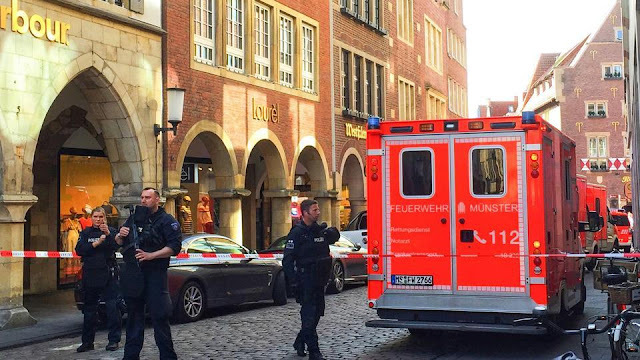 A suspected terrorist attack has occurred in Germany killing 3 people. A vehicle crashed deliberatly into a crowd on a beautiful Saturday in Muenster, North Rhine-Westphalia, German. Three people were killed and 20 others injured, police said. The driver shot and killed himself after the purposeful crash. Authorities are treating the incident as a deliberate attack. The attack happened in the old part of the German city. The vehicle drove into a restaurant's outdoor terrace around 3:30 p.m. local time. Muenster, has a population of about 300,000 people. Ulrike Demmer, a spokeswoman for the German government, said on Twitter. "Our thoughts are with the victims and their loved ones". Interior Minister Horst Seehofer said in a statement, "Police in Muenster and throughout are now working hard to investigate the matter."